Caves and prehistoric art and the beautiful Gorges de l'Ardèche! Although the Gorges de l'Ardèche (Canyons of the Ardèche) have long been known to French visitors as a holiday site, the opening of the nearby Caverne du Pont d'Arc in April 2015 is bringing more and more visitors from around the world to this lovely area. 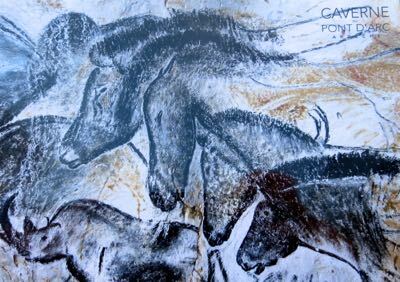 The Caverne du Pont d'Arc includes dramatic paintings of horses. Here's a suggestion for a nice day trip from Orange. If you like swimming, pack your swim suit and a towel, and don't forget the sunscreen. -Reserve and buy your tickets on line for a morning viewing at the Caverne du Pont d'Arc. You'll want to spend at least two hours there—one hour for the guided tour, another for the exhibits. There's also a restaurant where you can have a coffee or a snack. -Drive to Vallon-Pont-d'Arc and have lunch in one of the restaurants on the main square or along the road, or buy some picnic supplies. If you want to do some boating, you can check with the canoe and kayak rental places in Vallon-Pont-d'Arc and make arrangements. There are also some boat rentals farther down the river. 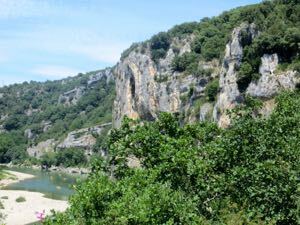 -Set off on the route D290 to enjoy the Gorges de l'Ardèche. 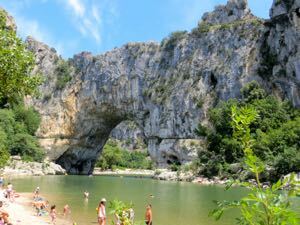 Your first stop will be to see the actual Pont d'Arc, a natural bridge over the river. There are small beaches near the Pont d'Arc, as well as several places where boats can put in and where you can rent boats. There are a couple of other caves along the route that offer visits as well. They do not have paintings, but the geology may be interesting. These include Grotte Madeleine and Grotte de St-Marcel. As you approach the small town of St-Martin d'Ardèche, you'll be leaving the Gorges area. If you still have time, you can take a detour to the right and up the hill to the medieval village of Aiguèze, with its fort, church, and other historic monuments. Be aware that driving on the roads in this area can be slow, as the roads are very narrow, the area is mountaineous, and in season there are many tourists and others on the roads. We suggest doing this excursion after you visit the Caverne du Pont d'Arc, because visits there require a fixed time reservation, and you need to arrive at least 30 minutes ahead of your scheduled visit. If you are unable to secure morning tickets and want to drive through the Gorges de l'Ardèche on your way to the Caverne du Pont d'Arc, be sure to allow enough time for not just the slow driving, but also for the frequent stops along the way. Here's an example: When we went, we left Orange at 8:15 and arrived at the Caverne du Pont d'Arc at about 9:45. Our guided tour was at 10:24, and we visited the exhibits after that, staying at the site until about 12:30. We had lunch in Vallon-Pont-d'Arc and looked around there a bit, leaving by about 2:00. We made several stops to admire the view in the Gorges, though we didn't swim or boat or stay long. We were back in Orange by about 5:00. Another side trip en route to Orange could be to the hilltop town of Mornas, with its ruined fortress. Although it has a bloody past, today it offers interesting visits and fabulous views. Above, The actual Pont d'Arc, a beautiful natural bridge. 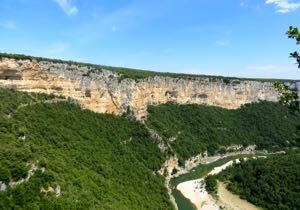 Below, Gorgeous views in the Gorges de l'Ardèche. Above, The cliffs in the Gorges de l'Ardèche house hundreds of caves.